According to official Romanian immigration law, citizens of most countries are allowed to visit and stay in Romania for no more than 90 days in any 180 day period of time. So once you’ve spent 90 days in this country, you must then remain outside the country for 90 days before being able to return. Yes, several months ago I obtained temporary residency in Romania. Now I am able to stay, and to come and go, as much as I want for up to one year. And at the end of the year, I can renew my residency as well. How did I manage to get this temporary residency in a European country? Did I get a job in Romania? Nope. Am I studying here? No. Am I in the Peace Corps or working for some other volunteer organization? No I am not. Am I marrying a local woman? Nope. Not yet anyway. So again, how did I, an ordinary traveler, manage to obtain residency in a country where I don’t have any connections, where I don’t speak the language and where I am not working, studying or volunteering? The answer lies in my favorite word – creativity. While eating dinner with a Romanian friend back in March, we started to joke about my sudden addiction to this country. At one point, she mentioned that I should just get residency considering how much I like to be here and we shared a good laugh at that suggestion. However, the next day, I started to think about what she said. I realized that if I had residency here, I wouldn’t have to worry about visas at all and I could actually have an official base in Europe. That possibility was more than enough to convince me to head down to the main immigration office in Bucharest right away. After waiting in line for thirty minutes, I was given a piece of paper that explained the seven categories of temporary residency visas and I was told by the clerk behind the counter that if I can fit into one of those categories, I can apply. But since I didn’t have a job offer or a volunteer stint lined up and I wasn’t about to enroll in a local university course, and I didn’t have any family living in Romania and I wasn’t claiming to be a refugee, the only category left was category #7 – “Other”. At first that seemed a bit disappointing but I soon realized that “Other” is actually a great category. It could be anything. All I needed to do was find a reasonably realistic reason to remain in this country and I could apply under the “Other” category. The following two weeks were interesting. It all began when my mom, out of nowhere, happened to email me one day upon discovering that a great-great-grandfather of mine was actually born in Romania. My mom even forwarded me the early 20th century US census sheet she found online that proved this fact. What timing! Let me tell you…I was mighty excited at this discovery and, with the census sheet in hand, I practically ran over to the immigration office. Unfortunately, once there, the woman behind the counter laughed at me when I told her I was a travel blogger who wanted to stay in Romania for more than 90 days in order to travel around the country, tracking down my family roots and writing about it on my blog. She told me that wasn’t going to work. But before I walked away, she also suggested that I set up an audience with the head of immigration to discuss my situation. The following day, there I sat in a large, sparse room across the table from two senior immigration officials. Well, they too laughed at me when I told them about finding my family roots and writing about the journey on my site, even though I mentioned several times that I would be promoting Romania as a result. They also said that wasn’t a good enough reason but, instead of telling me to leave, the immigration officials asked me some questions and after discussing among themselves for a few minutes, they gave me a possible solution. They told me that I could find an organization to partner with, an organization that would be willing to sponsor me in exchange for me writing about them on my blog. If I could do this, I could actually obtain residency in a European country. Shaking their hands several times, I left the room and immediately started contacting everyone I knew in Romania. This was actually only three people, so I had to kindly ask these three people to please contact everyone they knew as well in order to try and find an organization that would be open to a partnership. Amazingly, a few days later, a friend of a friend informed me that he knew of someone from his hometown who works with a local NGO aimed at promoting sustainable tourism in Romania. And just like that, after a couple of conversations, I agreed to help spread the message of this NGO and to promote their projects online in exchange for a sponsorship. We created and signed a contract and back to the immigration office I went, where I handed over my folder containing the residency application form, a health certificate (which I got in 10 minutes at a local clinic here), the receipt for the residency visa fee and a couple of other forms I needed to fill out. Then the woman took my photo and simply told me to come back in thirty days. Thirty days later I walked into the immigration office once again and a few minutes later I walked back out with an official Temporary Residency Card in hand. Success! I know you might be thinking that it was easier for me to get the residency visa because I have this blog. However, I could have done the exact same thing above without a blog, creating a partnership in which I would write articles about the NGO and submit them to online publications or I could have offered to assist with their social media efforts. I could have found any local company or organization and tried to use my skills/knowledge/interests to work out a mutually beneficial partnership. Of course, if you do have a website or any kind of online presence at all, you can certainly use that to your advantage. And in the end, if you do work online in any capacity your chances of obtaining residency will be higher as it shows that not only do you have sufficient income to support yourself but you won’t be taking away local jobs. Either way, it all comes down to creativity. Think outside the box and the possibilities are endless. If you find a country where you want to stay/live beyond the usual tourist visa restrictions, the first thing you should always do is go down to the immigration office and learn the rules. Find out the steps you need to apply for a residency visa, what categories are available and exactly what is required for each category. Asking these questions in person is far better than trying to interpret information on a website. Then start brainstorming until you figure out a way for you to enter into a partnership with someone or some company or organization. If there is an “Other” category available, that very well could be your best bet as it will be much more difficult to obtain residency in categories that require employment or volunteer contracts or proof of university enrollment. Finally, try to make an appointment to speak with the immigration officials before you apply for residency, even if this is not routine in whatever country you’re seeking residency in. Explain that you have a unique situation that doesn’t fit into the normal categories and before you apply and pay the application fee, you want to ask some questions. Then, during your appointment, be sure to mention that with your situation you’ll just be spending money in the local economy without taking jobs and without relying on government benefits or assistance. And don’t be afraid to ask for suggestions. If anyone knows what is required for you to obtain residency, it’s going to be the immigration officers, so try and get them to give you as much information as possible. You never know, they might be willing to help you out and give you some ideas, just as the officials were willing to do for me here in Romania. The bottom line is that if you wish to have a foreign base without having to worry about the validity of tourist visas all the time, residency is the way to go. Of course, the above is not going to work every time or everywhere and it might not even work the majority of the time either, but if it does work, and you establish temporary residency somewhere, life as a long-term traveler certainly becomes so much easier. Do you have residency or have you thought about obtaining residency in a foreign country? Have you tried to get residency? Any tips to share? I will be going to romania soon for educational purposes, my course will take 6 to 7 years to complete including the language year. Can I apply for permanent residency after 3 years as you mentioned? even though I am a student? Hey Sam – From what I know, you need to first apply for temporary residency. Once you have that for 3 years, then you can apply for permanent residency if you fit into one of the categories. I don’t think being a student is one of the categories though. You will probably just remain on a student/temporary residency visa the whole time but I can’t say for sure. Nice blog, Earl. You’ve given a lot of people hope. I’m an American, lucky enough to be married to a Romanian, and we plan to retire there in a few years. But for a long time I searched for a way to live in Europe, my favorite continent. Your blog offers some good information for those trying to get there without big money or fancy degrees. Thanks, man. P. S. You can read how I met my wife in Sibiu and my thoughts on Romania in my travel blog, Dave Europe. Note: it’s rather long, almost a year of travel around the world, so you’ll have to do some scrolling to get to the Romania parts. Hey David read your post and it looks like we share few things in common as a traveler…Europe is also my dream continent to retire as an Electrical Engineer meanwhile Romania got me interested that I would love to get married and settle down with a Romanian lady. And thanks to you Earl I love what you doing… God bless you. If you are married to a Romanian you can get a 5 year residency permit on that basis alone. I’d just be sure you really want to retire in Romania because that’s kind of like your last stop. Nothing against Romania per say but I’ve lived there for years and I feel like I should warn you so you don’t make a mistake that will be hard to fix when you are old. It’s cheaper in Romania if you want to live in a few rooms in a concrete block but if you want to live an American style retirement it will cost you more. Everyone will say that is not correct but that is because they haven’t done it. Everything in Romania ends up costing more except fruits and vegetables and yes you can have a shelter that is clean and safe for less then in America but for an American style home it will end up being more..you’ll see. – If you smile at people in Romania, like in a store they will think you are strange. – If you say Hello (in Romanian) to people in Romania walking by they will not reply and start walking faster. – Gas and electricity is approximately twice the cost and in my case to bring gas about one mile would have cost about $25,000 and then all the neighbors along the way could have gotten gas from that pipe without reimbursing me in anyway. – Neighbors are extremely nosy and extremely jealous if you have something they don’t. – There is no concept of time. If you have a slightly exotic car , your car can stay for months at a service shop with no apologies. – The internet certainly is nothing like the high-speed internet I am used to in the States but it is better then Western Europe. Internet costs are cheaper but so is the speed and in order to be sure to have working internet I had three subscriptions, costing me the same amount. I understand there may be rural areas in the US or some lower cost alternatives that are poor in comparison to the Romanian average speeds. – There are basically no real highways and a road trip that would be 1 hour with a highway and is 3 hours without one may be 8 hours if there is traffic. Thanks for sharing your thoughts Ryan. It is interesting though as I’ve spent over 4 years in Romania myself and didn’t reach the same conclusions on many of the aspects you pointed out (especially the internet, which is some of the fastest and cheapest in the world). Also, I did find it to be quite inexpensive for a foreigner. I went to medical specialists who had trained in the US and UK and paid half of what you mentioned for a visit, which included treatment. Same with dentists. And I actually found neighbors to be the opposite of what you stated…it would often be difficult to get even a ‘buna ziua’ from almost all of them. Everyone tended to very much keep to themselves. I’ve also driven around the country at least 7 times (and I mean around the entire country) and I never experienced traffic apart from in Bucharest and coming back from Brasov on a Sunday afternoon. There are highways in several parts of the country as well and besides, part of the beauty of living in Romania are those 3 hour journeys through the beautiful mountains and countryside! Anyway, it’s always interesting to hear people’s different experiences and I certainly do appreciate you sharing your own! A few more thoughts from my earlier post. A lot of Romanian people, if they comment, will be negative and you may even think something is off and I must be wrong. If I don’t convince you about the dangers of Romania just keep it in the back of your head and even if years into your stay in Romania you start to realize what I am talking about it remember what I said, my warning and know you are not alone..trust me the place can drive you crazy..no matter how thrilled you feel with it at first. Think about food. Nearly all Romanian restaurants serve food at lukewarm temperature. Goodbye hot soup and cold ice cream. Hope you don’t like your drinks including your beer cold and no ice. (That may seem ok for a week, a month, a summer but try it year in and year out). I tended to eat only at more expensive but popular restaurants in Romania. My rule of thumb is you will get at least mild food poisoning 1 in 10 times. At the supermarket because the refrigeration is rarely set at a properly cold temperature the same rule of thumb applies with meat, even well before expiration date. Expect it to be turned 1 in 10 times. You will not go to the supermarket customer service desk and get a smiling face that will say ”sorry” and replace your purchase or give you cash back quickly like in the States. You will have some rude, ill-mannered individual tell you the meat isn’t expired or wasn’t when you bought it. The same will apply with any food or any product you may buy at nearly any store with any defect. You might be a TV like in the US in Romania at twice the price but if has any technical problems (with electronics the rule of thumb for a product having a defect is 1 in 5 purchases from all my experiences)you will get the runaround and they will do everything possible to not fix it. I mean even a television bought a day earlier with errors. I bought electronics from Amazon UK which were cheaper even including shipping and ironically when I bought a Blu Ray player that was made in Romania and did not work, they quickly sent me out a new one. Next, drivers are worse in Romania then any country I’ve seen except India. Your chances of being in an accident are very high. Even in resort towns cars will drive up behind you on sidewalks and run you over if you don’t jump out of the way. No matter how relaxed and laid back and chill you may be now, it’s bound to wear off in Romania. I just found it very mentally traumatizing. It just really made me almost anti-people. I always tried to be nice and helpful but found that most people were simply not either of the two..unless they were looking for money. Of course, this isn’t always the case. There are fantastic people in Romania. There are good places to eat. There are good drivers. They are honest merchants (ok not sure about that last one.) However you’ll spend your life trying to navigate and find them admist a sea of evil. I know many will find that offensive but I find those people offensive because they are so busy defending Romania versus trying to actually improve anything. I feel like there is a high level of brainwashing of the public in Romania which makes them very defensive of ”outside” attack and more willing to accept any kind of corruption in their own country by their brothers. Oh incidentally Romanians in general are antisemitic, racist, homophobes, etc. so you unless you are like that you may not care for this aspect either. I’ve had nice times out with even younger people and then they proceed to rant against Jews or some other nationality. Nah man, avoid this place. Please. Trust me. Hey Ryan – Once again, I didn’t experience things such as frequent food poisoning and defects with products, and taxis were pretty easy to use without any hassle once I learned which companies to use. And anti-semitic, racist and so on…I would definitely not classify the people as that. Sounds like you clearly had a different experience and whatever the situation, the frustration just built up to the point of seeing everything from a more negative angle. Sorry to hear that was your experience as I, and many others, have had a completely different one. Fay, be careful about staying past your legal time frame. You do not want to break any laws in Romania, trust me. This post was pretty helpful! I am an American applying to school in Bucharest. I have been there multiple times before and know this is a place where I feel at home. If I am accepted in June then great- no worries. However, if I don’t get accepted I still plan on going there and staying past the 90 day limit. I would not work but instead live on my own or with my best friend who also goes to school in Bucharest. My only valid reason to stay would be to do volunteer work, learn Romanian, and wait to apply to school again. I know you only know from personal experience but do you think this reason could be valid if justified well? I have no experience with obtaining visas or residencies. Hey Fay – They’ve become a little stricter and those kind of general reasons won’t be accepted as valid reasons for a long-term visa. You really need to fit into one of the defined categories (studying, working, volunteering with an NGO on a contract-basis, etc.). The main way to do it would be to enroll in a language school to learn Romanian. Then you can apply as a student although you will need to show proof that you continue with the studies. Hi Earl, we have an American friend currently in his first 90 days of stay in Romania. As per current regulations he did not require a visa to enter the country as a tourist but he must leave in 90 days. He was hoping to get residency here during these 90 days. When calling the immigration office they said that he must have first a visa (for volunteering, study etc.) and then he can apply for residency. You mention visa and residency in your article and actually they seem to be 2 different things in Romania. your resindency ID .. clarifies you went through the process end to end. So retroactively.. when you first entered Romania – did you have a visa..? did you need your visa from Romanian Consulate in US (or another country) in order to build on that .. the paper work for permis de sedere – residency? Hey Iomada – I didn’t have a visa when I entered Romania and you can get a residency visa even if you don’t have a visa when you entered. Many people I know have done this and that’s how I did it as well. Hello Iomada – I think there was a issue with terminology. What the immigration office is talking about residency – that is when you get a normal 5 or 10 year Romanian ID (Bulletin). Foreigners can get this if they have been living in RO for 5 years (some absence is allowed), you meet certain conditions, and can read/write Romanian at a satisfactory level. 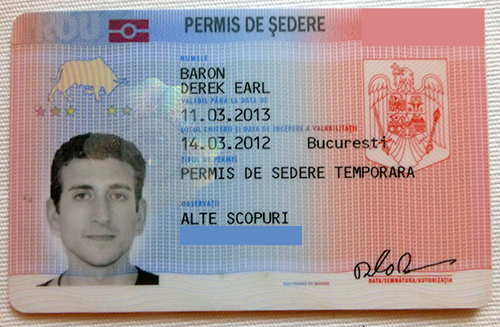 The permis de sedare is a one year visa for staying in RO beyond the allowed 90 days every 180 days. I hope this explains the difference. And as Earl stated, Americans can come to RO under a 90 day travel visa and 30 days before this visa expires can apply under various provisions to get a one year visa/Permis de Sedare. I had two weeks visa from Africa, I need to know if I can get residence permit in Romania. Hello Earl, Thanks for your great contributions. Please let me know few benefits of having permanent residency in Romania in terms of travelling to other european countires as you claimed that it is possible after many years. Hey Timmy – Those benefits would kick in once you get permanent residency or citizenship. It does take many years to reach that point though. with your temporary visa, do you think that you’d be able to become a permanent resident, and then eventually into a citizen? Hey Jean – The way it works is that after renewing the temporary residency visa for three years, you can apply for permanent residency. And then I think you have to wait 5 or 7 years before you can apply for citizenship. Thank you for your reply!has it been 3 years for you yet? Have you applied for perm res? Romania is actually a relatively easy country to become naturalized in, particularly if you’re a US citizen. They love Americans considering much of Bucharest seems like it IS in the United States. It’s also an easy country to get residency in by starting a business; much cheaper than Belgium for instance. Hi Earl. Thanks for your information. Very helpfull. You said you created and signed a contract with the NGO you found. What kind of contract was it? Did they pay you the minimum wage sallary requiered for you to be able to get ur permit to stay? Because i know that s one of the criteria requiered. And what about the place you re staying.. is it enough to live in a romanian s home or do you need a rent no matter what? Many thanks! Hey Mary – The idea with the NGO route is that you are not getting paid but instead, there is an exchange of services. If they pay you, then you need to apply for an employment visa which is harder to get. With that said, it’s getting a bit more difficult to get the residency visa these days and so you might need to start a shell company instead in order to get the permit. Is there any benefits for non Europeans with Romanian residence outside Romania,? Eg; If you are on a visit to other European countries. Hey Sam – At the moment, no, it doesn’t help you with the Schengen Zone unfortunately. If Romania makes it into the Schengen Zone, that it could change. I am from Los Angeles, and wanting to move to Europe also. I have an Associate’s degree in Sociology from a community college. I am currently receiving disability pension from the military. I get $750 monthly from disability pension. Will it be possible to move to Europe and gain a residence visa? Just a quick question; i’m assuming this allowed you to work legally within Romania. I’ve noticed that Romania is the outsourcing centre for IT work within Europe; so there are a lot of jobs there. However, what I don’t know is the employers attitude towards sponsoring Visas of foreigners. (Non EU citizens) … Wondering if you had any experience with this? Ash, well your assumption is not correct. You would have to get a separate work visa to legally work in RO. From what I understand, it is not an easy process. Your employer would have to show that they tried to advertise the position and there was no qualified applicant who is either from RO or within the EU. I’m sure there are other websites that describes the process. If you own your own company, you may be able to avoid obtaining a work permit if you are performing consulting work for IT companies. Just a thought and this would first need to be researched further. what happens after the 1 year. are you able to keep applying and keep staying? Hey Nayeem – Yes, I can apply again after the year is over. Year is up…. did you reapply? Hey Matt – I didn’t as I moved on now and am no longer staying in Romania. I presently live in Belgium and work in France. I suggest you try searching for teaching jobs in Belgium. I saw a handful of English Teaching jobs and I know the pay is good. There could be other opportunities but I do know of the Language Jobs. Thank you for sharing this with us. Im 22 and writing from Mauritius and recently completed a Bachelor Degree in law from a british University Branch Mauritius and i would like to move to France or the UK (including Ireland) to work. I also possessed a Secondary Teaching Certificate for English and French subject. Do i have any chance? Hey Nella – I’m not too sure actually. I just don’t know enough about France’s or the UK’s immigration rules to tell you your chances. I only know what happened with me here in Romania. Hey Nella, so pleased to see there’s a Mauritian here. I am also from Mauritius and have been living a nomadic life. I know I’m late in my post, have you managed to make it to France/UK? i live in bangladesh but my GF living in Romania. And we want to marry now..
Hey Monica – That’s hard for me to say as there are so many factors involved. The thing is, first decide on where you want to go and why and then start researching ways to legally make it happen. It’s much easier to achieve something once you’ve narrowed it down instead of having a broad goal of ‘move to europe’. Once you narrow things down, you can find real information to help you achieve your goal. Hey Johnny – In the end, it just takes some networking. If you are here in Bucharest, you can go to some cafes, start talking to people, join some meetup groups and before you know it, you’ll have a network of friends. And then, I’m sure it wouldn’t be too difficult to create a partnership with someone…there are plenty of people who have already made it happen! Hi I’m studying in Moldova , I’m citizen of Bangladesh, now I want to know that can I come I Romania without visa you know Moldovan economic situation is now in crisis, for this reason I want move to Romania permanently, could you help me please. I will wait for your reply. Hey Shafiul – I’m not sure how it works in your situation unfortunately. I only know how I did it based on my own circumstances. many thanks for your quick answer. The application must be done once in Bucharest right? Hey Sim – Yes, you can only apply for the temporary residency permit once in Bucharest. Hi Earl, I’m Italian and I’ll be moving to Bucharest for job in June as I got a 3 years contract with a Romanian Company. My gf is american and would love to join me in Romania but the problem is getting a VISA. She told me nobody would hire her if she doesnt have a VISA beforehand so my last chance is to marry her within the first 90 days of her stay but I’m not sure either if it is a viable solution. Hey Sim – I’m not too sure how that works unfortunately but your GF could try to apply for the temporary residency permit based on the fact that you are a couple and you have a job there. It really doesn’t take much to get that permit, all she needs is a decent reason. Getting a work visa is much different and much harder to get though. The temporary residency permit does not allow her to work, only to live and stay in Romania for 1 year (it can be renewed each year). To get a job in Romania though, that’s a different thing and I’m not sure how to make that happen over there. Hi earl. I want to know is it possible for a indian to come to romania? And get the residency here? Hey Mo – I’m not sure what the rules are for student visas. It depends on how long you’re allowed to stay in Romania on a student visa. Hi Earl, It’s really nice of you to share your experience, specially your positive attitude. It deserves appreciation. One thing intrigues me, may be some other EU countries offer better options for temp. residency permit. Why don’t you throw light in that arena too? Moreover, if someone is ready to offer recognised professional services at No/Low cost, will be it be at par with other requirements to get the permit? Hey Bando – The reason I can’t shed light on that is because I have no idea 🙂 I only know how it worked for me in Romania as I’ve never tried it in other EU countries. hi so i would have to find a job or a school to get a residency permit other than 90 days us passport? since staying at a family or a boyfriends house is not enough as long as i have financial fund to afford for a year? Hey Earl nice article! I was wondering how do you travel to EU/Schengen states with your temporary residence visa? I ask because I too have Romanian temporary residency but I am a passport holder of South African Nationality. I find it annoying that i can’t travel to Hungary which is basically neigbours to the West of Romania, more specifically Oradea, Debrecen. Hey Raleen – For me, I don’t need the Romanian residency visa to travel to Europe…I just use my US passport which allows me to travel to the EU/Schengen area. I read your reply Earl and you should have your Romanian Temporary Residency Card when you travel outside of Romania. Usually, if you have stayed in the Schengen Area for more than 90 days out of last 180 days, you need to prove that you didn’t overstay and that is done by showing your RO Card. Although RO and Bulgaria are not part of the Schengen Area, starting in 2014 stays in RO and Bulgaria are included in the 90/180 days for Schengen visits. If you can’t show your card or they can’t easily look you up in the computer system, you may have to pay a fine and/or get clearance from the appropriate authorities that may delay your trip. It’s better to know this to prevent issues. Hey Torey – You can read my posts on how I earn my money but in short, I work online, including this blog and other projects. Hi, Is it possible to apply for a temporary residence permit with a good reason by saying that I will be staying at a boyfriend’s house and enough money to support myself financially? Hey Esha – No, that won’t be enough to get residency. I wanted to know, I’ll be staying for 90 days or more, I’m a US citizen and have a passport. Do i need to go to a nearest embassy in California to apply for a romanian visa, or it’s easier to apply in Romanian Immigration Office, with a temporary residence permit? I’m staying over 90 days within 180 days but i only will make 60 days, and still have 30 days left but it’s more than 180 days allowance. How can I get this properly done? Hey Esha – You cannot apply for the residency from the USA. You need to apply at the immigration office in Bucharest. Hey Earl, thanks for a great article that gives me hope. I actually have family in Romania so that should help. My question is, now that you have the Romanian residency card, are you allowed to travel through all the EU countries without a visa the same as a Romanian citizen? Does that card change your status for other EU countries or is it still based on your US citizenship when it comes to EU travel? Hey Ian – The temporary residency does not change anything but after having this for a couple of years, you can apply for permanent residency, which does change your status in EU. Great story of creativity! 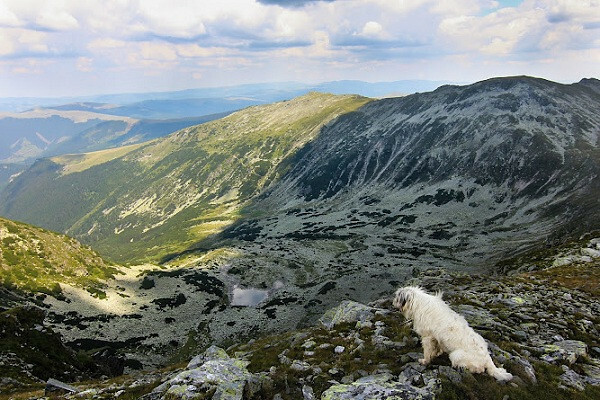 And, I share your love of Romania, totally awesome place. But Bucharest? Probably the worst city I’ve visited in Europe, or most overrated at least. Most people who visit Bucharest don’t like it, but those who stick around longer tend to love it. It’s actually quite a great city once you discover all it has to offer but that does take some time. Earl, thank you very much for your post. It is a real help to many of us in a similar situation. I wonder if you can offer a couple of points about what is required for the Romanian partner organisation in terms of sponsorship? Is it a financial one, or do they have to act as a guarantor? I’d love to start organising this discussion, but any points or tips as to what was required would be a great help for a happy reader! Hey Sarah – It cannot be a financial deal. If money is exchanged, then it is considered work and you would have to apply for a work visa, which is very difficult to get. So you have to exchange some non-monetary service for some other non-monetary service in order for it to work. There is no need for a guarantor. You are just trying to prove that you have a situation that requires you to stay in the country for more than the allowed 90 days with a tourist visa. Hope that helps! Just found the blog – love it! Been reading through some posts on how you pay for it all – very interesting and creative stuff and thanks for writing about it – and then read this article on residence in Romania which made me think about how you handle background infrastructure such as tax, insurance, banking etc. I noted somewhere on the site that you’d been in Romania for 18 months so according to their tax rules that would make you liable in Romania for income tax on your worldwide income (exempt in 1st year, liable second year onwards). Do you worry about or get involved with that kind of thing or just try and stay under the radar, go with the flow and move on if necessary? Hey Irene – I actually haven’t been in Romania for 18 months. I’ve now used the country as my base for two years but have only spent about 6 months there total. While I do always follow the rules for stuff like that, in this case it doesn’t apply. any ideas about business we can do in romania. i am civil engineer so prefer in my line of business or manufacturing. Do you need a car to operate in Bucharest? I live in New York ; don’t drive so am wondering…. How on earth do you make living blogging? Now this I want to know, because if I can figure it out, I’M BLOGGING HONEY! Wonderful post. Very informative. Do you have a list of the documentation which Romania required for the “permis de sedere temporara”. I am a US Citizen and my wife is a dual Romanian / US and we travel to Romania frequently. It would be nice to not have to worry about the 90 days out 180 day period. I am assuming I would need an apostilled marriage license but I am not sure if there is any other paperwork that would be required from the US. A more detailed how to or list of documentation would be extrememly helpful. Thanks! Hey Dustin – I wouldn’t know what is needed for a fiancee visa over there as that would be a different category than what I needed. But in general, all you would need from home is a letter from your doctor stating that you don’t have any communicable diseases. I didn’t need any other documentation, apart from my passport. Hi! Encouraging Post. I live in the USA and I am going to be in Romania in January for 6-8 weeks and then may possibly return in May or June for a longer period of time. I have been reading about the visas and visiting, but some of it is a little unclear to me. If I come as a visitor in January, How long do you have to wait before you can return. On the US Embassy website it kind of sounds like you have to wait six months. Do you know if this is true? How much did it cost you to get a temporary residence visa? Hey Danielle – You can stay in Romania for 90 days out of any 180 day period. So once you have stayed for 90 days (it doesn’t have to be at one time, it’s the total number of days in that 180 day period), you have to leave for 3 full months before you can return. The residency visa cost around $275 USD or so in the end with all of the notarizations of documents, health insurance and other fees. That was very creative. I am also thinking of obtaining a residence permit for Zanzibar,TZ and I just sparked a creative idea of my own. I haven’t been to romania yet but am thinking of visiting Malta. What can u share about malta? Great post Earl. Thinking outside the box and ”Carpe Diem” is the way to go to achieve our dreams = Creative problem solving. I enjoy your Blog. Keep it up. Hey Egret – From what I know, you have to take a written test in Romanian to get a drivers license here. Hi. I really admire your strong willed personality. I’m Kenyan, been living in Dubai for 6yrs and want to live in Belgium. I actually have Belgian guardians there, a very amazing family who can take care of me , but getting residency there is proving to be quite a pain. Belgian laws are changing by the minute, therefore its really hard to move. I’m not going to give up and I hope something will come up. I can do the 90days visa but then I have to live out for another 3 months which I don’t want to.. Complicated stuff. Don’t know what to do now..
What a fantastic way to go about!! Hey Jerome – At the moment no, but if Romania joins the Schengen Zone (which might happen soon) then yes, it will allow you to do that. Hi Earl! Very interesting and inspiring story. Good advice about speaking to immigration officials, I’ll be sure to do that. One thing I don’t get is how you were able to even apply for a residence permit, because from reading Romanian government websites I understood that you can ONLY apply for a residence permit if you’re there on a long-stay visa (category D) and getting THAT is the hard part (you need to show your reason to be in Romania, health check, criminal record check, finances, etc.) Could you clarify what kind of visa you had? Was it a regular Schengen tourist visa (category C) or something else? Hey Evgeny – Romania is not part of the Schengen zone so I just had the normal 3 month Romanian tourist visa that I receive upon arrival. And I believe what you are referring to is the permanent residency. I applied for, and receive, temporary residency which is good for 1 year and can be renewed 3 times. I need a residency permit to apply for a Schengen visa, and at the same time I am seriously contemplating on staying in Romania for a longer period of time. This article is a lifesaver. Thank you so much! Hey Earl! I have been living in Romania for 63 days now and I was looking for a way to stay. Would I be able to apply now, or am I too late into my 90 days to do so? Hey Karen – As far as I’m aware you can apply at any time. I applied when I only had 20 days left out of my 90 days tourist visa, so it shouldn’t be a problem. Hey Earl! You’re a very lucky man! I never imagined something like this could happen. I have a couple of questions, how much time did you wait to obtain the residency? And how much did it cost? And is this “other” solution available in all EU countries? Hey Alio – Once you apply, you have to wait 30 days to find out if you received residency. The total cost is approximately $340 USD but it can vary. And to be honest, I’m not sure if this is available in other EU countries…I’ve never tried it anywhere else and don’t know of anyone who has. If I hear anything, I’ll be sure to post it on the blog. Hi Earl, i was just surfing on net and i found your blog, i read your story (article) and i am happy that you have solved your visa issue in an intelligent way. “Where there is a will, there is a way”. A very nice story to read.Seriously BRAVO! to be honest i have came across your post while trying to get some information about Romanian residency and traveling to other EU/Schengen countries, and i believe since you’ve passed through this hustle of all the paper works you might be helpful. I have a cousin of mine that is going to Romania by January, he got offer a job there which he is excited to commence with them. Now my question was: With this type of Work Residence Permit, would he be able to travel to other european countries? Because what i heard is that, the only type of residency that allows you to travel to EU/Schengen is the Family residency. Would you please be kind enough to get back to me with an answer if possible. Hey Yassine – To be honest, I don’t know the answer to your question as I can only speak of the temporary residence visa that I obtained, which does not allow me to work. I’m not sure of the rules with other visas. could you tell us the name of that NGO, or do we need to visit ROM to find out !!! @SpringHawk – It’s called Focul Viu. Bravo & congrats to you!! Interesting post. I found your blog while searching for residency in foreign countries. Great to see the way you got your things done in Romania. I’m an Indian staying in India and not to mention why I have the least possibility of getting the PR of any country. But I seriously want a peaceful life and so desperate to escape from India. Hope to get it some day. If you have any suggestions then please guide me out. Just to let you Tyrhone there is no such thing as an English passport only a British passport. You are born English but you can become British. I travelled through Romania last Spring and fell in love with this country. It does not seem to western-ized yet. Happy you found a way to stay there longer. Anyway, we really enjoyed staying in Bran. If you go in this area, you have to go to Villa Predelut. The guy there is extremely welcoming and he has a little patio to work online from the garden with direct view on the Transylvanian Alps. Lots of nice trails also in the same area. Hey Manuel – I did visit Bran last year when I first arrived…and all of Transylvania was very enjoyable in the end! Thank you for the recommendation about Villa Predelut…I have not heard of it and will check it out for my next visit to the region! That’s damn creative, well done, Earl. There’s a lot you can get away with (legally) in this country as long as you at least try and DO. Hey Matt – You said it right…most of the time it’s just about trying! Too often we simply think ‘oh, that’s impossible’ but if we would start asking some questions, we often find the situation to be completely different. Your experience proves that there’s nothing impossible. A little bit of ‘luck’ (or timely preparation I would call it) and creativity would bring us great opportunity. Thanks for sharing this Derek! Yet, another practical inspiration from you! It goes to show you what a little creativity and persistance can help you achieve a goal – no matter how “unlikely” it seems. After reading this post it’s not surprising that you have been able to travel for so long! That’s awesome! It goes to show you what creativity and persistance can do for someone’s life. It’s not a wonder that you have been able to travel this long – you never gave up! Very cool, Earl! Am trying to do the same thing over here in Sweden. I’ve had temporary residence as a student for 2 years now but since my studies are just about over and have no offers of employment, I may need to get pretty creative as well. What kind of benefits do you receive as a temporary resident? Any sort of health care? Curious how it is in Romania. Great article Earl. Just goes to show what can be done with a little creativity. Whether it is obtaining a Visa or finding a sponsor/partner to work with it is all about thinking outside the box and creating your own opportunities. Sounds like you and Romania are both getting good deals here. Hi Earl. I have enjoyed your colorful descriptions of travel with illustrious verbiage to define the wonders of which you have experienced. However, I am perplexed. How can you be “wandering” if you have, and I quote, “I’ve now spent over 140 days in Romania since the end of December 2011.” It seems like you are actually “Romanian Earl” instead of wandering. And honestly, I am so sad that you have lost your adventurous spirit. I realize that this comment is not of the genera which you normally approve, and that I take as the truth. But know this, I enjoy your blog, and if by chance you want to address my concern, I think I am not alone in your followers to deserve an answer. But yes, so far this year I have spent a significant time in Romania, and to be honest, I’ve done this so that I can work on some new projects that I’ve created and be able to continue earning money. It is not easy to earn money online while constantly moving around and also, to earn money online one needs to constantly be working on new projects and ideas. So I decided to take six months to stay in one place (even though I’ve still traveled quite a bit during this time) and work on these projects I have. I wouldn’t say that’s losing my adventurous spirit at all…instead, I’m using that spirit to find a way to continue wandering around the world for as long as I want without having to go home and get an office job. Also, staying in one place for a longer period of time certainly offers a much different, and incredibly rewarding, experience for a traveler as I have been able to connect with Bucharest and its people more than I have ever been able to connect with any other destination I’ve visited. So I see nothing wrong with enjoying all types of travel experiences and I’m quite certain that the overwhelming majority of the readers of this site agree. You certainly can’t blame me for wanting to earn money so that I can continue with this lifestyle and taking 6 months to help my situation is not such a big deal considering that I’ve been on the road for over 13 years! After catching you in Brooklyn NYC in April and again in Istanbul, Turkey in May I can vouch for the wandering! This is a very inspiring post Earl. I am so thrilled to also try this, perhaps not in Romania but somewhere else. I am so touched by this. I love the way you say it when u filled the “other” portion to which you obviously belong while applying for the permanent resident visa in Romania. Romanians are indeed very accommodating and kind. Cheers Earl for your new-found home! Hey Wends – I’m sure you can make it happen in a different country that most appeals to you…there is always a way! Earl, thank you so much for posting this inspiring story. I’m really impressed with your outside-the-box thinking! Congratulations and enjoy your newfound home in Romania! Thanks for the info. I’ve begun looking for info about the Schengen visas. I’m planning a visit to France (since I’m in Quebec and we have French roots, it’s often useful) consulate to inquire about residency visas. UK consulate could be useful too (being a Canadian, member of the Commonwealth) but UK isn’t part of the Schengen zone. Based on your story, I doubt I’ll have much problem finding a sponsor if needed… but my problem is I don’t want to be forced to have a permanent address in a given country… I want to be able to be constantly roam all over Europe without being tied to one country where I’d have to return to every X days for example. Hey Sylvain – Every country has their own rules as to how much time you have to spend inside of the country when you have residency…some are quite strict while others are quite lenient. And having an address doesn’t mean you need to be there all the time…I have an address here in Romania but it’s nothing I consider permanent. That is AWESOME! Would have never thought of that. Now, whenever I like a country I don’t know well, I’m sure as heck hitting that immigration office to see what’s up. As always, an excellent, informative article Earl! Thanks Maria and yes, now you have a new idea the next time you do find a place you that you could picture yourself using as a base for a while! My hero! I’ve had a mini mission for the past year to try to figure out a way to get a base in Europe, gives me hope! Great article, I enjoyed reading it! Good to know there are possibilities for staying longer in countries that you really like. have a great time in Romania! I found your blog through a top 10 or something travel blog list, and I really enjoy your posts. You definitely have a good online voice and you have some pretty awesome tales to share (this one included… AMAZING.. residency! Whut!)! I will soon be quitting my job (4 more weeks) and then beginning my own nomadic journey (for as long as my heart desires – fingers crossed). Anyways, I’m sure you’re not short of compliments on your stories, but it never hurts to get some more… does it!? Great read!!! I agree you are amongst the top 10 of which I’ve been reading. Glad I found your blog. Hey Megan – I really do appreciate the comment here as it does always help to know what new readers think of the site. So, welcome to the blog and I certainly look forward to interacting with you some more as you begin your own adventure! Very thrifty of you earl. Very, very interesting. Most of the time you wouldn’t even think about temporary residency, nevermind the creative way you beat the system. Border-hops usually the way it’s done. I have to say that it sounds like you had amazing immigration officials there though, wonderful of them to go so far as to basically tell you how to circumvent the usual protocol. Who says they’re all mean, corrupt, disinterested, and rude? Hey Chris – Indeed, those were very nice immigration officials I dealt with. And before I began the process I was warned by several locals that I would face nothing but a bureaucratic nightmare but in the end, I experienced nothing that even remotely resembled such a thing. What a fantastic and inspiring post my friend and such creativity to find a solution, we all knew it was there somewhere, to your challenge! You know, there’s hope for all of us after all thanks you! Glad everything worked out in your favor!! Hey Jeff – There is definitely hope for everyone!! I went through the hassle of getting a 2 year residence visa in the UK, but it does not sound like such a hassle after reading what you had to do! The UK is nearly not as interesting as setting up base in a country like Romania, but at least it is a base for me to go out and see more of Europe for a while. I will be heading to Romania in December/January. If you are still there you should show me some of the sights! Hey Kieran – A base is a base and as long as you’re happy over there in UK, then that’s all that counts. Not sure if I’ll be in Romania during the winter this time around but if I do end up here, I’ll be glad to show you around. What happen to you was really fun and cool. If I’d known you were looking for an ONG in Romania (and if I would have read your blog then) I would have offered our organization’s help. It’s a Cultural local Organization named DTS Flow (in Drobeta Turnu Severin) and for our next project, in September, this year, we have a cultural experience exchange with Cyprus, Macedonia and Serbia, and us, and it’s all happening here, in Romania, Orsova (you’ve pass by on your way to Serbia for your holiday via train). We will talk about cultural differences, music, dance, traditions and anything we think is an issue with people and cultures all over the world. Your blog will help me create some debates about how others view us, but if u have anymore ideas that could help me I’ll be glad to write them down. Again, I like reading you, and I’m glad you are fond of Romania. I hope you will find someday a place that you would wish never to leave it behind, because that place will definitely be the best place in the world considering you have seen everything. Hey Alina – That sounds like a very interesting ONG you are involved in and when exactly is the cultural experience exchange? What dates in September? I will certainly have a think and see if I can come up with any ideas for you for that event…I always find it fascinating when people discuss their preconceived notions about a place in comparison to the reality they discover when they actually visit that destination and meet the people who live there. Usually, we find that the countries we visit are very different than what we think we’ll find!